Babies spend countless hours asleep. We know -- it sure doesn't seem like it right? But it's true. According to the Mayo Clinic newborns may sleep as many as 16 hours per day while older babies to toddlers log about 8-12 hours of sleep per day. Disbelief aside, unless you co-sleep, your baby will be spending a lot of time in her crib snoozing, so a safe and healthy sleeping space is vital. Luckily, there are plenty of amazing safe and green crib options available. 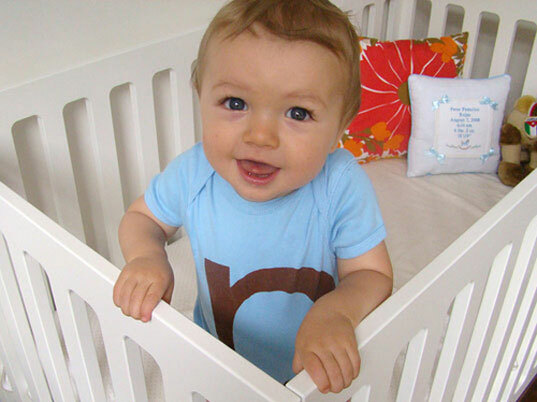 Following are seven of our favorite eco-friendly cribs for green babies. The Oeuf Robin Collection Crib not only provides an eco-friendly sleeping space for your babe, but affordable sustainability as well. The family friendly price of just $565 makes it easy for parents to keep it green — and while Oeuf scaled back the price, they didn’t skimp on eco aspects. The Robin Collection Crib is made of sustainable Nordic pine and birch and finished with water based, eco-friendly paint (absolutely zero VOCs!). To round out the affordability factor there’s a Robin Collection Conversion Kit available that seamlessly transforms this stylish crib into an equally stylish toddler bed. Sustainability and low cost.. it’s like hitting the Mother Nature jackpot. The Ninetonine Zebra crib is one of the most imaginative crib designs we’ve seen for the nursery. Better yet, the Zebra crib, while unique is not simply form without function. The zebra’s head of this fanciful crib doubles as a useful handle and a tray for bottles, burp cloths and more. The ‘tail’ is a handy set of shelves with a set of wheels so the crib is easy to move around if you need to vacuum or if your baby just needs a change of scene. The Zebra crib is made from sustainably sourced oak and pine, with non-toxic lacquers and paints. Plus, in keeping with the use it up aspect of sustainable living, this crib can easily be converted to a day bed for your baby when he hits the toddler stage. The Leander Bed, a lovely Scandinavian import, is oh so much more than your typical crib-to-toddler-bed conversion. You can easily transform this handy bed into a whopping five varied configurations. Made of sustainable birch, the Leander crib-and-mattress combo, starts off as a raised cot, which can be lowered when your baby gets more mobile. Later on, one side of the crib can be removed, thus creating a toddler daybed. Later still, remove the second crib side and you’ve got the perfect junior bed. Lastly, (whew) the bed can be lengthened to accommodate growth spurts because, like us, Leander gets that all kids are unique and deserve an eco-friendly place to rest. The Eicho crib boasts a slick white hue to brighten the nursery, along with a family-friendly price tag — making a green nursery an achievable goal for eco-conscious parents. Made with 100% recycled and reclaimed formaldehyde-free MDF and topped with a non-toxic finish, the Eicho crib offers three adjustable positions for the mattress platform so that all babies, regardless of size, can snooze comfortably. Argington masterfully creates baby furniture with its own special flare and the Bam Collection is no different. 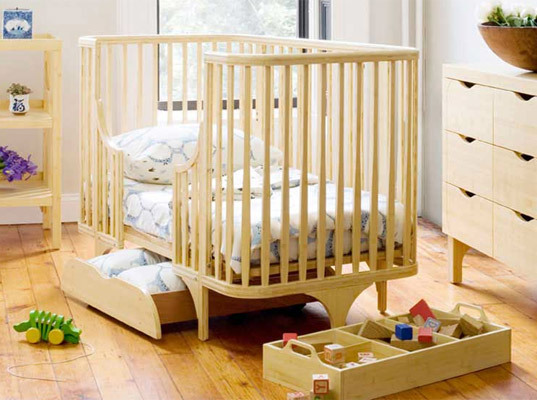 To save you some time and money the Bam Collection offers a sweet bassinet that can be transformed into a crib then toddler bed via cost-friendly conversion kits. All of the various sleep configurations boast the same lovely swooping lines and safe materials. 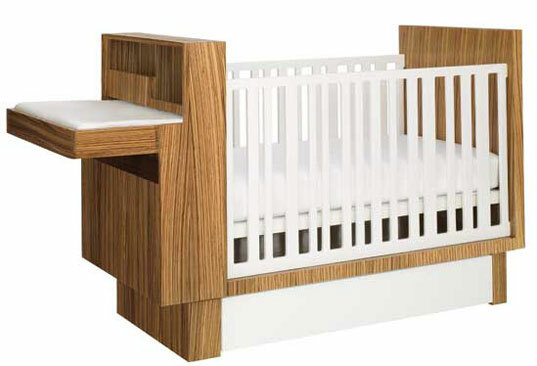 Made with solid birch and birch ply wood (for ebony and white finishes), or solid bamboo wood, this crib is a safe sleeping spot for your little one — certified to be free of formaldehyde emissions. 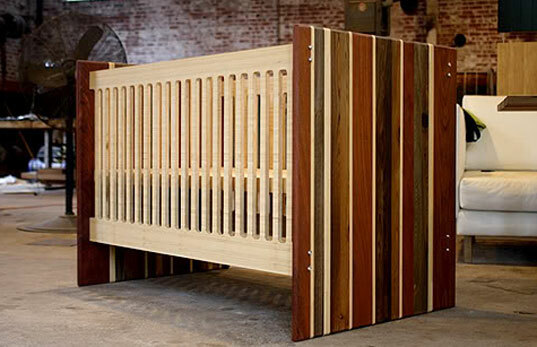 The beautiful Oops Crib by Structured Green features a bold new aesthetic in baby furniture, complete with “Drop” detailing, gorgeous variegated strips of reclaimed woods, bamboo siding, and a finish of raw, food grade tung oil. Structured Green uses only quality materials that are sustainably produced, certified or reclaimed, recycled or recyclable, to create their lovely furniture pieces. The modern Studio Crib from Nurseryworks boasts multifunctional design that helps stretch parents’ furniture budget while enabling families to save space in smaller homes. The Studio Crib expands to meet the needs of your little one as he grows, serving as both a crib and changing table in one. Later, as your tot springs into toddlerhood you can easily convert this crib into a toddler daybed and desk. Nurseryworks uses renewable materials to create their furniture — such as Paulownia wood; a fast-growing, richly grained, fire- and decay-resistant hardwood, along with low-VOC finishes, lacquers, and glues and formaldehyde-free dyes. The Oeuf Robin Collection Crib not only provides an eco-friendly sleeping space for your babe, but affordable sustainability as well. The family friendly price of just $565 makes it easy for parents to keep it green -- and while Oeuf scaled back the price, they didn't skimp on eco aspects. The Robin Collection Crib is made of sustainable Nordic pine and birch and finished with water based, eco-friendly paint (absolutely zero VOCs!). To round out the affordability factor there's a Robin Collection Conversion Kit available that seamlessly transforms this stylish crib into an equally stylish toddler bed. Sustainability and low cost.. it's like hitting the Mother Nature jackpot. The Ninetonine Zebra crib is one of the most imaginative crib designs we've seen for the nursery. Better yet, the Zebra crib, while unique is not simply form without function. The zebra's head of this fanciful crib doubles as a useful handle and a tray for bottles, burp cloths and more. The ‘tail’ is a handy set of shelves with a set of wheels so the crib is easy to move around if you need to vacuum or if your baby just needs a change of scene. 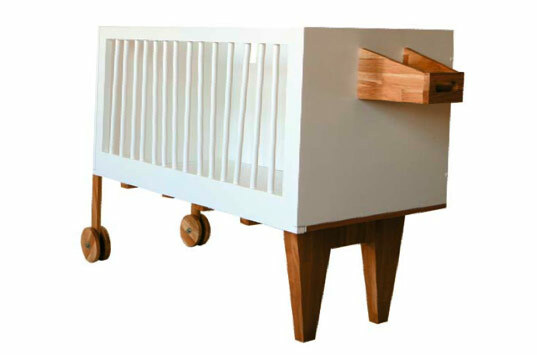 The Zebra crib is made from sustainably sourced oak and pine, with non-toxic lacquers and paints. Plus, in keeping with the use it up aspect of sustainable living, this crib can easily be converted to a day bed for your baby when he hits the toddler stage. The Leander Bed, a lovely Scandinavian import, is oh so much more than your typical crib-to-toddler-bed conversion. You can easily transform this handy bed into a whopping five varied configurations. Made of sustainable birch, the Leander crib-and-mattress combo, starts off as a raised cot, which can be lowered when your baby gets more mobile. Later on, one side of the crib can be removed, thus creating a toddler daybed. Later still, remove the second crib side and you've got the perfect junior bed. Lastly, (whew) the bed can be lengthened to accommodate growth spurts because, like us, Leander gets that all kids are unique and deserve an eco-friendly place to rest. The Eicho crib boasts a slick white hue to brighten the nursery, along with a family-friendly price tag -- making a green nursery an achievable goal for eco-conscious parents. Made with 100% recycled and reclaimed formaldehyde-free MDF and topped with a non-toxic finish, the Eicho crib offers three adjustable positions for the mattress platform so that all babies, regardless of size, can snooze comfortably. Argington masterfully creates baby furniture with its own special flare and the Bam Collection is no different. To save you some time and money the Bam Collection offers a sweet bassinet that can be transformed into a crib then toddler bed via cost-friendly conversion kits. All of the various sleep configurations boast the same lovely swooping lines and safe materials. 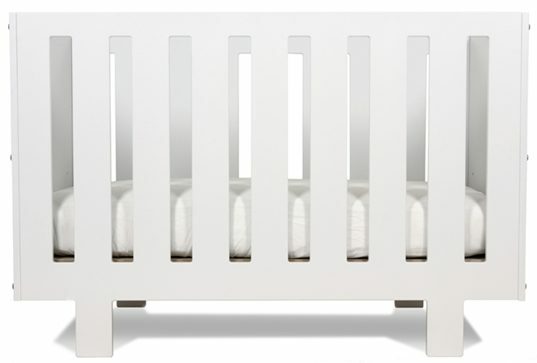 Made with solid birch and birch ply wood (for ebony and white finishes), or solid bamboo wood, this crib is a safe sleeping spot for your little one -- certified to be free of formaldehyde emissions. The modern Studio Crib from Nurseryworks boasts multifunctional design that helps stretch parents’ furniture budget while enabling families to save space in smaller homes. The Studio Crib expands to meet the needs of your little one as he grows, serving as both a crib and changing table in one. Later, as your tot springs into toddlerhood you can easily convert this crib into a toddler daybed and desk. Nurseryworks uses renewable materials to create their furniture -- such as Paulownia wood; a fast-growing, richly grained, fire- and decay-resistant hardwood, along with low-VOC finishes, lacquers, and glues and formaldehyde-free dyes.